When choosing a new bathroom vanity for your home, you have many options available. The first choice you have to make is what kind of vanity is right for you. Today we will be discussing the many types of bathroom vanities. Cabinet Style – The cabinet style is the type of vanity you are probably most familiar with. It is, quite simply, a sink (or two) built into the top of a cabinet. These are very popular choices because they provide extra storage space in an area that would otherwise be wasted. Undermount Sink – An under mount sink is mounted underneath the bathroom counter. They are typically used with stone or composite countertops and have a very clean and elegant appearance. Drop In Sink – The drop in sink is installed through the top of your bathroom counter and sealed around the rim. They can be used with any countertop material and are a very common choice. 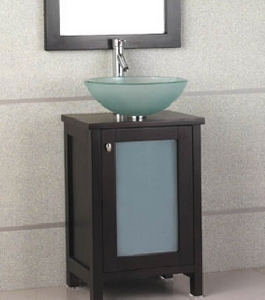 Pedestal Sink – A pedestal sink is mounted on a pedestal, or column, that is secured to the floor. Pedestal sinks have a classic style that is very eye catching, but don’t provide the storage space of cabinet style vanities. Vessel Sink – A new style, the vessel sink is pictured above. As you can see, it consists of a bowl mounted on top of a vanity and can give your bathroom an artistic flair. These do require non-standard plumbing, but that is a small price for such a beautiful vanity. Wall Mounted – Wall mounted sink are very basic and can be found in many homes and businesses. They mount directly to the wall and do not require a vanity for support. These are the most common styles you will find today. Take a look at many examples of each type to find one that is right for you. Outer Banks Custom Kitchens is your place for bathroom vanities in Hatteras . Call us to discuss your plans and desires for your Outer Banks bathroom remodeling. With 50 years of experience on the beach, from Ocracoke to Corolla, Outer Banks Custom Kitchens can give you the kitchen of your dreams.